Last week I cut the cereal rye growing in the beds that will hold my Bloody Butcher corn. The rye was shedding pollen. At that point it most likely won’t grow back if cut. Cut it earlier and it will, cut it later and it will already be on its way to seed. Cereal rye seeds look somewhat like wheat, not to be confused with ryegrass that looks like grass seed. This rye was planted last fall. Its growth crowded out the weeds and soaked up any goodness in the soil, holding it to give back to the next crop. If I didn’t cut it now to lay down as mulch, I would leave it grow out to seed in June. My harvest then would be straw as carbon for the compost pile and seed to plant or eat. Managing cover crops this way is a sustainable no-till method. I lay down that rye by cutting it with a Japanese grass sickle, sometimes known as a kama. I leave the rye lie in the bed for two weeks to settle, then transplant into it. The rye biomass becomes the mulch for the corn, tomatoes, or whatever crop has been transplanted into it. The rye cover will gradually decompose and feed back the the next crop. In the case of the corn, two weeks after the corn goes in, I interplant sweet potatoes. The sweet potato vines spread out all over the area and provide a living mulch that covers the soil after the surface rye decomposes. Years ago I bought the grass sickle I use from Hida Tools. It is their model with a 6″ blade. I added the hole in the handle and the cord to hang it up with. A less expensive model is available from Way Cool Tools here in Virginia. Obviously there are some differences, but if you are on a tight budget, the less expensive one can get you started. My video Cover Crops and Compost Crops IN Your Garden shows me in action cutting wheat and rye with it. On a larger scale you could use a scythe. Cereal rye puts down a tremendous amount of roots that compost in place once the rye is cut, adding organic matter to the soil. Timing is of upmost importance. You want to take advantage of the natural progression of the plant. Once it starts thinking of going to seed, root growth stops and the energy goes to seed production, which is why you want to wait until pollen shed to cut it. After the pollen comes the seed. Unless you are growing that crop to harvest the grain, you want to cut it before viable seed is formed, or you will be replanting it right there if you leave it lie as mulch. 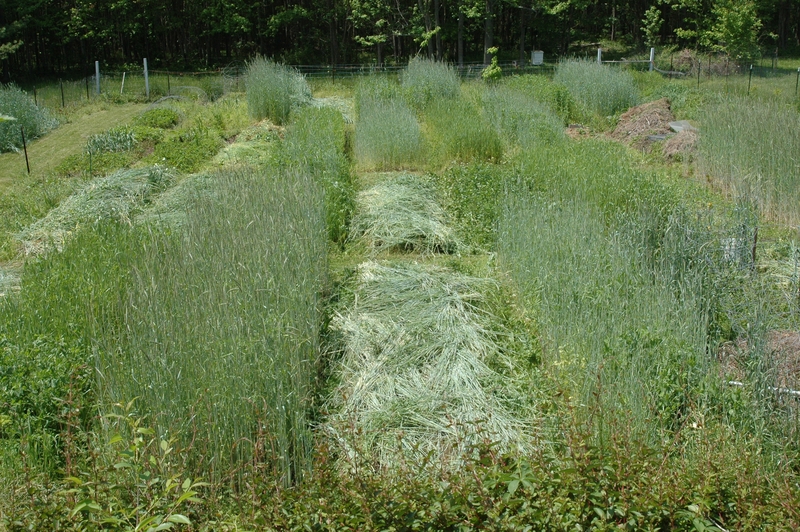 Of course, sometimes you will want to grow it out to seed and harvest the grain and straw. More about that in a later post. By not tilling the soil, you are preserving the organic matter. The roots of your cover crops do the tilling for you, going down deep to open up the soil, allowing air and water to penetrate. Once you have a good rotation in place with cover crops you will notice your soil getting better and better. However, it is important to have a dense cover or the weeds will creep in. Late planting, poor quality seed, inexperience, and of course, the weather are some reasons that could lead to a sparce cover. Once you understand how it all works, you will most likely be more successful. If you do have weeds, pull the rye mulch back and do a little cultivating. The tighter your rotation plan, the less chance for weeds to take hold. As soon as one crop is harvested, the next one goes in. You will want to use a strong trowel or a soil knife to transplant with. 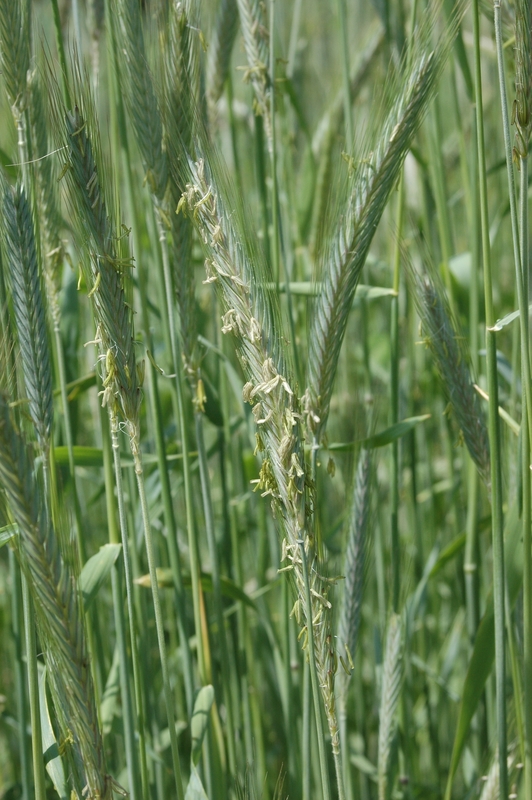 If the roots are still too tough to transplant into two weeks after cutting the rye, you may want to wait another few days or a week and try again. If the rye is actively growing back, it was cut too soon and you will have to do a little more work to cultivate. Make a note to cut later next year. This method works great with tomatoes, cucumbers, and squashes, to name a few crops, however planting this way means you are putting them in maybe as late as a month after your last expected frost. If you are really in a hurry to plant earlier, you would want to use a different preceeding cover crop. Legumes such as hairy vetch and Austrian winter peas can be taken down earlier. Actually, there is a little of the legumes in my rye crops. The book Managing Cover Crops Profitably, 3rd edition is an excellent resource to help you decide which cover crop would suit your needs. It is available through sare.org. My video Develop a Sustainable Vegetable Garden Plan shows you how to plan cover crops into your rotation. Cover crops used to be something you only considered planting if you had a tiller to manage them. Managing them with hand tools in your garden is possible. The learning is in the doing. My rye lodged from wind and rain. I need to see at what stage my plants are…Probably forming seed by now. Should I attempt to grow it out so that I can harvest the seed or just cut it back and hope the seeds are so immature that they won’t reproduce? The seeds wouldn’t be viable yet, so you can cut it back with no worries. I’ll be harvesting my rye for seed in mid-June. If you can’t thresh out some seeds that look like they would be mature, then they’re not. If you think the rye will stand back up and want the seed, let it grow out. If you have hairy vetch in with it and the vetch is pulling the rye down, you might as well cut it now. If you have Austrian winter peas in it, those plants can be pulled out for the compost pile and the rye can grow out. In the beds with the wheat and rye I’m growing out for seeds, I pull the legume plants out when they begin to flower, which is about the same time the rye is shedding pollen. I plan ahead and the legume interplanted in those crops grown for grain is Austrian winter peas, which is easier to handle. Hairy vetch is great with the rye and I use that in the beds that will be cut at pollen shed so I don’t have to worry about it pulling the rye down. We’re having pretty wet weather here right now, next thing you know it will be dry again and we’ll be looking for rain. For information on harvesting and threshing grain grown all the way to seed and straw go to my post on 6/14/11 Grains in Your Garden. I went to Hidatools to try to order a sickle. You mentioned it was the model with the 6inch blade. There are three models each with a different thickness of blade. The thin and medium thick blades are 7″ and the thick is 6.5″ . Would that (6.5″ thick) be the one? Thank You for your time. I have really appreciated all your materials and the dvd I purchased. They are so helpful! 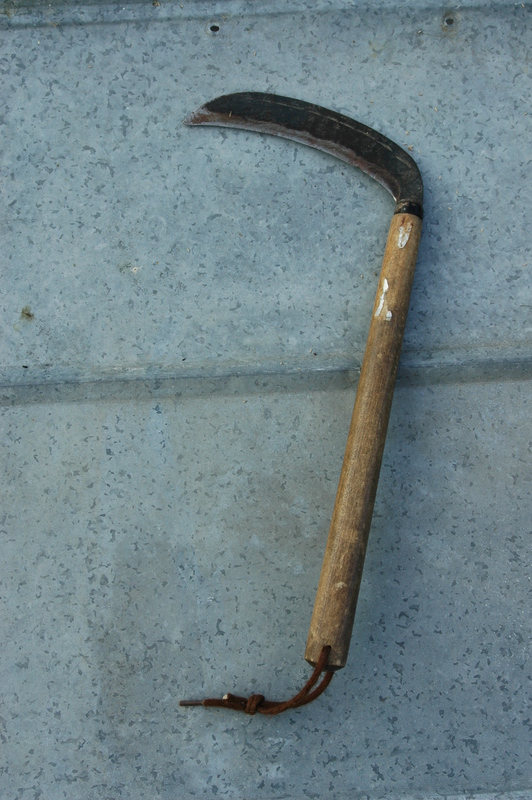 LeeAnn, you can find a sickle just like I use at Purple Mountain Organics–http://www.purpletools.net/kusakichi-sickle/. They know me and if you mention wanting one like mine, they will make sure it is the right one. Thanks for posting all the great info on cover crops and gardening. Probably the best information I have come across. I plan on ordering your DVD over the winter, for use in the coming year. We just planted our very first cover of cereal rye this fall. Crossing my fingers that all goes well. I’m happy you have found it helpful. Rye is a great cover crop! You won’t be able to plant that space as early in the spring if you are managing it with hand tools, but it is worth the weight in the benefits it imparts on your garden.